THE MANGROVE IS LIFE, NOT MERCHANDISE! Increasingly, organizations, companies and governments are promoting the discourse of so-called green economy, creating a vision for several years and have taken more strength in recent summits and conferences on the environment such as happened at Rio +20. The Green Economies are included within the green capitalism. The proponents seek to incorporate nature in economic systems, putting a price in order to negotiate pollution and ecological destruction. As Peoples, communities, organizations, and individuals, we are calling on you this July 26 to join our voices, from America, Asia, Africa, Europe and all over the planet, against the false statements that promote the commodification of nature, mangrove wetlands and other ecosystems and seek to bring them to a market scheme. Carbon markets, clean development mechanism (CDM), sustainable certifications, and other perverse incentives, seek whitewash operating activities and high social and environmental impact as the shrimp farms, salt mines, plantations, mining, oil, dams, industries and hotel ventures among many other threats. We reaffirm our position that mangroves should NOT enter into the logic of commodification of nature. NO to the economy and green business. NO to the certification of shrimp farming industry. NO to so-called Clean Development Mechanism (MDLS). These proposals are part of the false solutions to complex problems like climate crisis, neither the states and governments want to address in depth. Affirm: the people own their land and are entitled to live in a healthy environment. The mangrove has a value that has no price. It is essential to implement development models that are based on respect for society and nature, with an intergenerational vision, comprehensive and long term. We add our voices, our hearts we add this on July 26. In the Pacific Northwest and Alaska, photos of boats and families engaged in traditional fishing activities are as beautiful to many as photos of small and organic farms on land. Acknowledging the value of family fisheries, celebrating the health benefits and flavors of wild fish, and working to protect marine resources for future generations, connect eaters, harvesters, environmentalists and policy makers. In support of small scale producers, Slow Food and Slow Fish have a commitment to community, healthy environments and food biodiversity. Oxfam’s support of the Slow Food USA Congress in Kentucky in April provided an opportunity for a fisherwoman from the Pacific Northwest to bring photos, recipes and stories of the heritage, hopes and concerns of family fisheries to the gathering. After catching wild salmon for nearly thirty years in Alaska and Washington waters, my heart is full of gratitude since I’ve witnessed nature’s nearly indescribable abundance – between 25 million and 65 million wild salmon returning to rivers of Bristol Bay, Alaska in a summer month. Most of the residents are involved in the commercial fisheries that supports thousands of families while providing a healthy food that travels slo-o-owly by boat and barge, in cans and frozen, to markets year around. This region is now targeted for exploitation of valuable, nonrenewable resources that are under the ground. Extraction would inevitably pollute the wild salmon rivers and destroy an indigenous way of life that has existed for thousands of years. Healthy wild fish populations seem to be viewed sometimes as deterrents to development. With rivers dammed, tidelands bulldozed, coastal waters polluted, wild species decline, causing collapse of economies based on once abundant common food resources. Currently, many decisions are being made throughout coastal regions and watersheds whether to resist or allow open pit mining, expanded oil and gas drilling, pipelines, coal trains, and other industrial development. When governmental support of cheaper competitive products and often foreign owned corporations/investors causes the value of sustainable resources to plummet, the door is opened for short term dirty industries to come into a region. Just as family farms on land are being displaced by mega-operations, small independent fishing businesses cannot survive when bad practices of factory farming are replicated in our marine environment. Many of the hazards are similar: concentration of ownership, subsidies providing unfair market advantage to large producers, introduction of genetically engineered and invasive species, usage of antibiotics, pesticides and other chemicals, voluminous amounts of pollution, which is uncontained in a fluid environment. Marine feedlot operations are expanding and many companies receive government funding for feed, cage and gear design research. Too often, global companies are exploiting coastal regions to rear high value foods for export, taking the profits away from producing nations and leaving the pollution and environmental degradation behind. At the same time, “certification” schemes are being introduced that ignore the basic flaws in intensive production of finfish, shellfish and shrimp – especially that the true costs of production are not paid since nature provides waste and chemical disposal. High value species, such as geoduck clams, shrimp and salmon, are reared for diners in wealthier nations. Many of the species that can be grown in confinement result in a serious protein loss since they are fed pellets composed of small fish, often harvested from coastlines of poorer regions of the world. Or their production damages tidelands and the aquatic web of life, which is occurring with geoduck and intensive oyster production in Washington State. In tropical regions, widespread elimination of coastal mangroves is occurring because of the expansion of shrimp farming operations. Industrial aquaculture that causes a protein loss and bankrupts coastal communities and small businesses is neither sustainable nor fair. Yet, aquaculture can provide nourishing foods, if environmentally sound systems rearing fish that consume plants are developed. As Slow Food’s founder Carlos Petrini stated, “Slow Food unites the pleasure of food with responsibility, sustainability and harmony with nature”. For those who relish eating seafoods, Slow Fish recommends common sense, curiosity and appetite to make choices that are conscious, delicious and responsible. Together with Oxfam, we can help turn the tide and ensure that appropriate food is available, affordable, sustainably produced/harvested, and enjoyed. ALTERNATIVE POLICIES FOR FOOD INDEPENDENCE OF SMALL-SCALE FISHERIES. As members of the advisory boards to the "World Forum of Fisher Peoples" (WFFP) and the International Redmanglar (RMI), we had the opportunity to participate in meetings with both associations and observe their agreement regarding "policy options on food independence," particularly in regard to small-scale fisheries (SSF). A "Small-scale fishery" is the capture and removal of aquatic species in marine, coastal, wetland, inland and island waters, where the operations are performed manually without the use of mechanized systems for hauling or collecting gear and whose production is primarily intended for local consumption and improving the quality of family life. Extractive activities that massively destroy the planet's ecosystems are practiced within a neoliberal political framework that globalizes natural resources and places them in the service of large multinationals who direct them towards high consumption societies. The path toward neoliberalism went first through a policy of national "regulations and protectionism" that helped turn into "developed countries" those countries who practiced it in the nineteenth and early twentieth century. But now, we the "developing countries" are forced to accept the neoliberal model, which now condemns and prohibits such "regulations and protectionism," and allows transnational companies from the "developed countries" to loot the land and its resources and negatively affect food self-sufficiency by impoverishing the people and systematically destroying the environment. The Convention on Biodiversity, Desertification, Climate Change, Ramsar, Rio 1992, Rio 2002, 2012, and others demonstrate their futility when multinationals take over a territory and engage in extractive economic activities, food production for export such as shrimp farming, intensive agriculture, monocultures, dams, mining and other megaprojects. The globalizing neoliberal model affects the Earth and threatens the food self-sufficiency of all humanity. Find a new political way of managing the planet's biodiversity based on ecosystem approaches, popular participation and food self-sufficiency. There are several proposals, including "Radical Ecological Democracy as an alternative to Globalizing Development" (Ashish Kathari (ashishkathari@vsnl.com)). It is also important to consider the proposal titled "Good Living in Harmony with Nature and Human Rights" by the "Andean Coordinator of Indigenous Organizations" (CAOI), and other proposals that present alternatives to the current materialistic and inhumane neoliberalism. The quality of life and activities of "small-scale fisheries" (SSF) in mangroves and in coastal and inland waters are key to achieving food self-sufficiency in fishing communities. Small-scale fisheries must be recognized, maintained and protected through policies and regulations so they can develop as key players in society. The "FAO Voluntary Guidelines in Regards to the SSF" are being crafted in consultation with government officials, business leaders, fisherfolk and SSFs. Once approved should become mandatory. Fisher-women are more marginalized than the fisher-men themselves. The great importance of their work is minimized or ignored in decision-making. They are fishers, food providers, and caretakers of their families and the natural resources. Highlight and encourage the important role of women in the struggle for food independence and sustainability of aquatic resources. The territories historically administered by the SSFs are now threatened by industrial fleets that have over-exploited marine resources in waters under their jurisdiction and in international waters. To achieve this, they use innovations such as "individual fishing quotas" that end up privatizing aquatic resources, usually with the support of international financial institutions, forcing countries in the South to sign onerous treaties. Even the United Nations Convention on the Law of the Sea (UNCLOS) in Article 62 paragraph 24 states that in regards to the "use of living resources: the coastal State shall determine its capacity to harvest the living resources of the exclusive economic zone. BUT, when the coastal State lacks the capacity to harvest the entire allowable catch, it shall grant access to the remaining allowable catch to other States through agreements or other arrangements." Thus, developing countries not only lose their food independence but also their national sovereignty. Radically oppose any conventions, treaties or any other mechanism that promotes the loss of sovereignty and the rights to the food provided by the sea. The FAO and some international agreements recommend the declaration of Marine Protected Areas (MPAs) to conserve marine biodiversity. These usually are areas where SSFs and artisanal fishing have already been able to conserve these resources for generations. While MPAs are important, the creation of these areas generally does not happen with the prior, informed and binding consent of fishing communities. When it occurs at all, the community consultation process on a new MPA is done hastily and only to fulfill a requirement prior to its formal declaration. Afterwards, the MPA is likely to be managed by an international NGO whose first activity is to prohibit fishing in the newly “protected” area. The consent of local communities to the declaration of new MPAs, should be prior, informed and BINDING. Local communities, indigenous groups, artisanal fisherfolk and SSFs should also play a leading role in the management of those areas. Again, and to emphasize its importance, local communities must demand, in line with the Biodiversity Convention, their right to that "Prior, informed, and specially, BINDING consent." I carry good news concerning our War against global warming! 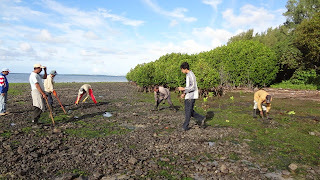 My team successfully completed the Mauritius Mangrove Restoration Project; a project I created and funded. The latter consisted of planting over 12,000 mangrove seeds (also known as propagules) along the shorelines of Mauritius. The project was executed on the 22nd and 23rd June 2012 under the supervision of the a representative from the Ministry of Fisheries. It was tough work which required a lot of effort and planning but I am proud to say that we made it! 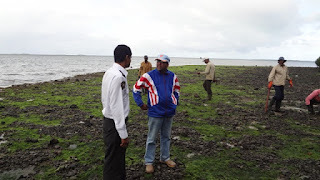 The initial aim was to plant 10,000 mangrove trees but we didn't stop there since planting more trees at that time was feasible... and we are not done yet! 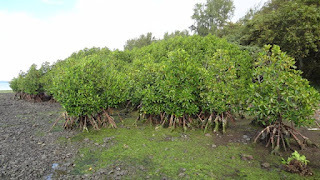 I come from Mauritius, an island off the southeast coast of the African Continent in the southwest Indian Ocean (2010'S 5731'E).Mangroves covered most of the coastline of Mauritius in the past. Over the decades mangroves have been destroyed for firewood, construction purposes,development purposes and for providing boat passages. They prevent coastal erosion and dampening action of waves on coastline. They retain terrigeneous sediments, thereby protecting the lagoons from the effects of sediments. They are one of the most potent carbon absorbers in the world. They provide food in the form of leaves and offering detritus trapped among their roots for a number of marine organisms. They provide habitats and nursery grounds for crabs, shrimp and juvenile fish. They provide substrates for fixation of oyster spat. Our project became necessary lack of mangrove plants in the lagoon was responsible for considerable decrease in yield of fish. About 70% of commercial fishes depend on mangrove sites during their juvenile stages, so healthy mangroves are vital as many people in Mauritius depend on fisheries (fishing, crab catching) to earn a living. Our main objective behind this project however was to lend a hand in the fight against the greenhouse effect.. A study by Malaysian professor Jim Eong Ong reveals that mangroves may sequester more carbon than any other ecosystem on earth. The 12,000 seeds were planted in various sites all located in the south-east of the island. The name of the regions are namely 'Bois des amourettes', 'Bambous Virieux', 'Providence' and 'Anse Jonche'. Please find attached pictures showing the areas where the seeds were reforested. 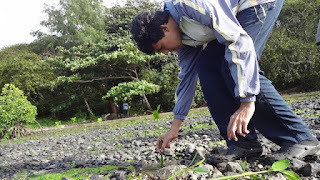 I was hoping that this project will sensitize the world about the benefits of mangroves. This would enable people interested in mangroves to contact me and encourage collaboration for future projects. Please feel free if you require more pictures or if there are any clarifications to be made.